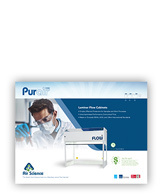 Purair® FLOW series laminar flow hoods are designed to protect the work surface, products and materials from particulate contamination. Room air passes through a HEPA filter then uniformly by laminar flow through the cabinet interior to protect the work from unfiltered air. The airflow is oriented to exhaust airborne particulate introduced by the user. 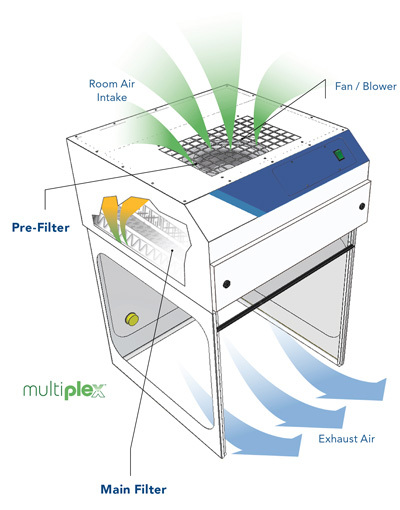 The Purair FLOW series product line employs the Air Science® exclusive Multiplex® HEPA filtration technology to sustain the contamination-free environment. High efficiency ebm-papst centrifugal fan. Air cleanliness meets and exceeds ISO Class 5. Large front opening provides unrestricted access to the work zone. 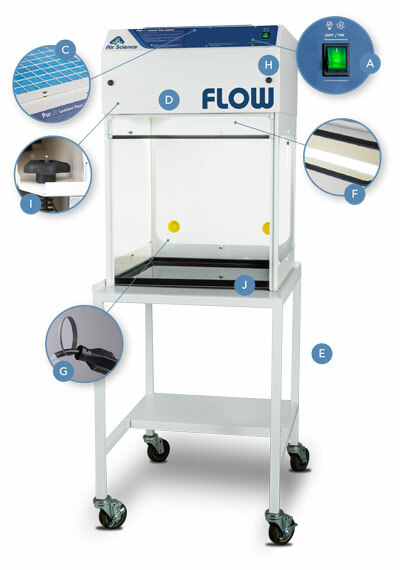 Purair FLOW-24, shown with optional spill tray and mobile cart. A. Control Panel: The control panel includes an On/Off switch for simple operation. 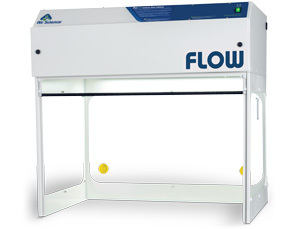 B. Airflow Alarm: HEPA filter with 99.99% efficiency for 0.3 micron particulates (ULPA optional). C. Pre-Filter: Disposable polyester fiber pre-filter with 85% arrestance. D. Blower Motor: ebm-papst centrifugal fan. E. Stand: Optional base stand converts to mobile cart with optional locking casters. 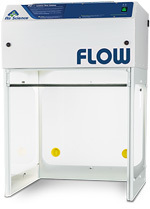 F. Lighting: Compact LED cabinet lamp located away from laminar flow area. G. Pass Through Ports: Convenient rear-wall pass through ports for safe routing of instrument cords, cables, and leads. H. Filter Door Lock: Prevents unauthorized removal or accidental exposure to saturated filters. I. Filter Clamp: Wide knob filter clamps are conveniently located forward of the assembly. The clamps secure the filter to the plenum with even pressure to assure a tight seal and to simplify filter removal and replacement when required. J. Work Surface: Optional polypropylene spill tray, available in white or black, or optional stainless steel spill tray available. Construction: All models are available in either metal or polypropylene construction, specify whenordering. Available in 120V 60Hz or 230V 50Hz models. The pre-filter can be changed while the unit is operating to prevent operator exposure to chemical vapors.